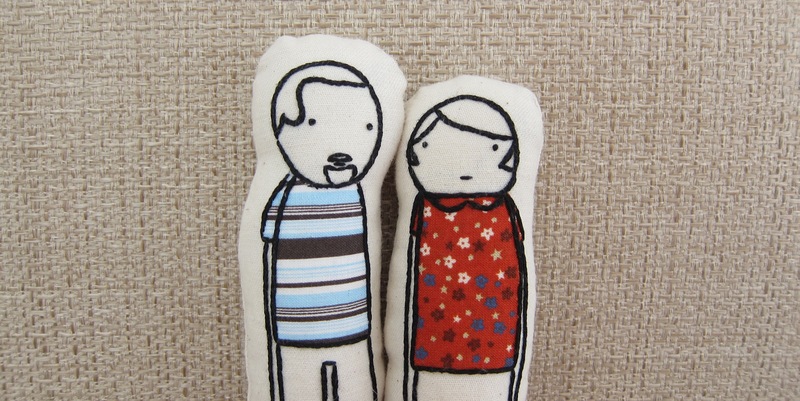 When I was in Ireland recently, I saw these cute little embroidered people pillows/dolls in a gift shop in Dublin. I loved the idea of them and thought I could make more personalized ones for Matt and I. With this week’s Iron Craft needle challenge I thought it would be a good time to try them. So, here’s little Matt and Kat. I tweaked the hair and added a beard and moustache to Matt’s. Then I added a pop of color with the appliqué for the shirts. 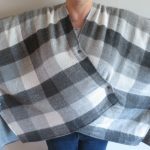 Really these were a breeze to make and I did them completely without a sewing machine (it’s packed to move). I think they are going to add fun little conversation pieces to our new place. My dolls are 7″ and 6 1/2″ tall and about 4″ around. You can do them as big as you want just make sure to get big enough pieces of fabric. 1. 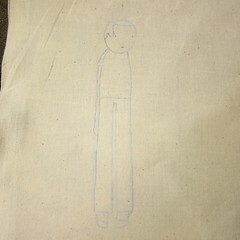 Draw out your pattern and then transfer it to your base fabric using the dressmakers tracing paper. I use a ball point pen on a hard surface to get a nice crisp dark line. 2. 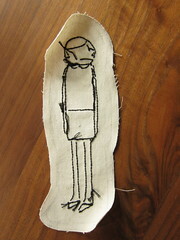 Using the same method trace the piece you are going to appliqué onto the patterned fabric. Cut that piece out of the fabric. Then cut a matching piece of fusible webbing. 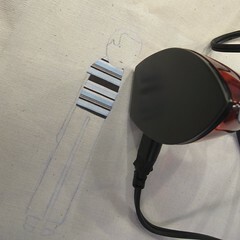 Iron the patterned piece onto the base fabric where it fits in your pattern. 3. Embroider your design. I used three strands of black floss and a basic split stitch. Embroidery right along the edge of the appliqués. For the moustache and beard I used a backstitch. 4. 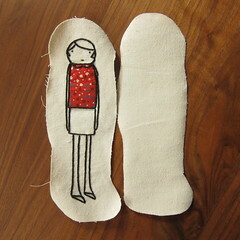 Cut out the front of your dolls leaving a border around the embroider and a seam allowance. For my dolls I used a 1/2″ border and a 1/4″ seam allowance. 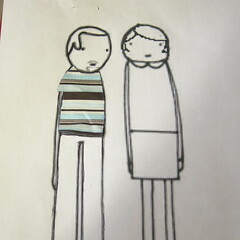 I drew this on the back so I could have a line to follow while sewing it together. Cut out an identical shaped piece from the base fabric. 5. Put the pieces together with right sides facing each other. Sew together leaving the bottom of the doll open. 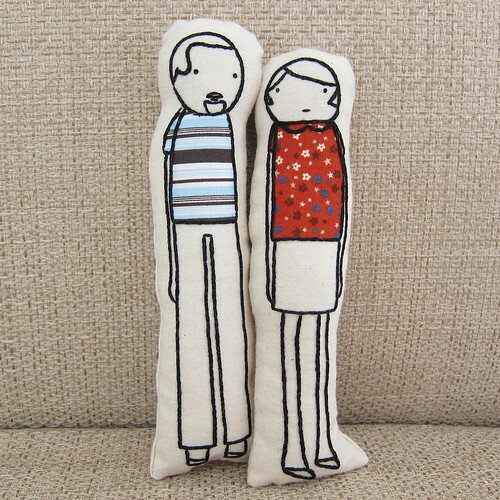 You can sew with a machine or by hand. I did it by hand in a backstitch. Clip curves if you want. Turn the doll inside out and stuff. Sew the bottom together with a blind stich. These really do make me smile. I hope that Matt is pleased with the way he is immortalized in fabric. I really admire the way you are still meeting all of your online commitments with everything you have going on in your life. I agree Dr. Russ- I can’t believe that she is able to keep doing the stuff. 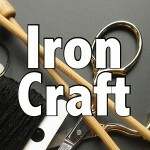 I long ago had to stop for our move but I promise that once we are all settled in Atlanta I will be back at Iron Craft. Just need to find schools for Thing 1 and Thing 2. What a darling idea! I can’t wait to try it out! 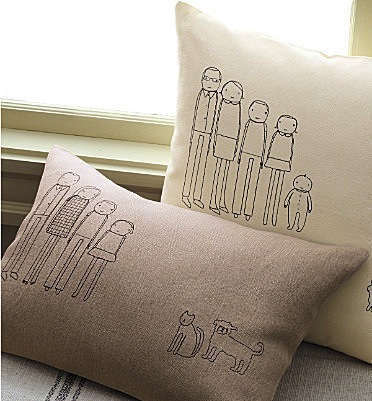 Just want to make you aware that the people (and the pillow you posted) are from Grand Rapids, MI artist Shelley Klein. Thank you for sharing that & the link. I searched & searched & couldn’t find anything except the pics from when Garnet Hill sold them. What a fun idea! After seeing your adorable pillows, I had to make some of my own.